As the number of billionaires and high-wealth millionaires increases, so do the extravagant offerings that prey upon their new money. There's money to be thrown around and, given the fact that there are 3,000 more households with $25 million or more than there were in 2014, there's a whole lot of new money looking to make a name for itself. "Despite ongoing concerns about market volatility and the direction of the U.S. economy, the number of affluent American households expanded in 2015," said George Walper Jr., president of Spectrem Group. This 1968 album has sold nearly 10 million copies in the U.S. alone. 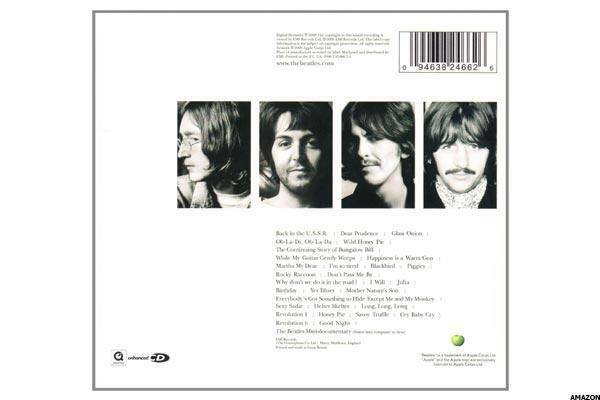 The story of the band's trip to India to write it during a meditation retreat with Maharishi Mahesh Yogi is entrenched in the band's lore, and the introduction of Yoko Ono to the mix, the infighting, the departure of George Martin and the point where Ringo Starr almost quit the band gave this album a backstory as full as the album itself. However, the fact that Ringo Starr actually kept a copy of this album after he'd basically been run out of the recording session by Paul McCartney's constant griping over the drum parts -- McCartney played the drums on "Dear Prudence" himself as a result -- is still fairly remarkable. Starr has been clearing out various Beatles effects lately and came across this one -- which sat in a vault for 35 years -- with the serial number 0000001 on it. It sold at auction last year for $790,000 which makes it the most expensive vinyl record ever sold. Meanwhile, if you want the most expensive album ever sold, the sole copy of Once Upon a Time in Shaolin that the Wu Tang Clan sold to pharmaceutical gouger Martin Shkreli for $2 million still holds that title. "Cé La Vi is a diamond in the sky. This could be the ultimate proposal, an exceptional occasion, or simply a celebration of life." That's Karan Tilani, director of Russian jewel firm World of Diamonds, justifying a grand gesture that would make Kanye West blush. 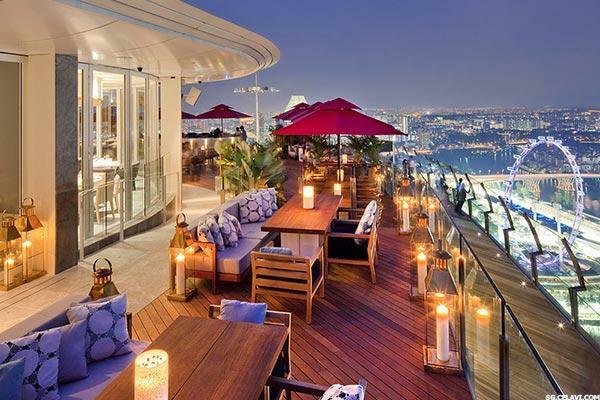 The 8-hour retreat affair starts with a 45 minute helicopter over Singapore, a chauffeured Rolls-Royce drive, followed by private cruise. Finally, at Cé La Vi's location on the 57th floor of Marina Bay Sands Hotel, you're presented with 10,000 fresh roses just before being fed an 18-course menu at sunset. That menu? Fresh belon oyster with champagne foam, almas caviar, jamón ibérico, gewürztraminer-poached foie gras, veal liver, lamb sweetbread, bresse poulet consommé, striped sea bass, air-flown alaska wild salmon, verjus sorbet, slow cooked pigeon, glenvale pork loin and apple-wood grilled mishima sirloin. All of that is paired with 1988 Salon 'S' champagne, 2008 Domaine Leflaive Chevalier-Montrachet Grand Cru, 1996 Domaine de la Romanee-Conti, Romanee-Saint-Vivant Grand Cru, 1961 Chateau Haut-Brion and 1972 Oremus Tokaji Aszú 5 Puttonyos. You'll eat it with diamond-studded chopsticks in custom armchairs that you get to keep. To top it off, you'll be sent home with a 2.08-karat Jane Seymour blue diamond ring that was worn by Seymour at Cé La Vi earlier this year. It's dinner for two, so it's $1 million a head, but if you're using this as a proposal, be very certain that you're proposing to someone who'll say yes. This is the House of Solid Gold's entire shtick: Take an everyday item that someone might show some remote interest in, lay some gold over it, encrust it in jewels and sell it for an astronomical price. This is the same house that made $15,000 gold earbuds (also known as the $15,000 gold tangled-earbud ball), $15,000 gold shoelaces and the $500 gold toothpick. 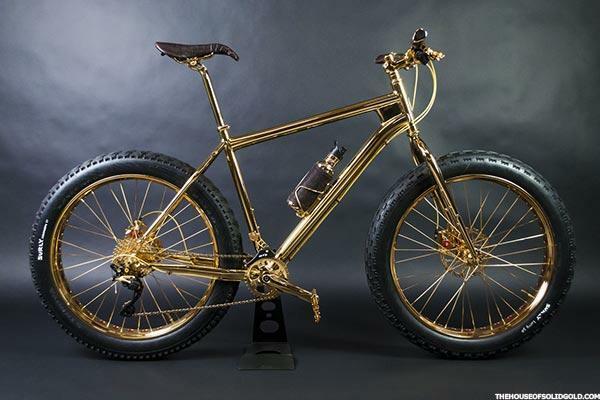 However, over the course of 750 hours, the house of solid gold created 13 gold extreme of these bikes, put 600 black diamonds (6.0 carats in total) and 500 golden sapphires (4.5 carats in total) on the frame emblem, covered the seat in chocolate brown alligator and wrapped the water bottle is covered in gold and with chocolate brown stingray-skin accents. With help from Veloworx Bicycles in Santa Monica, Calif., the House of Solid Gold created a mountain bike that will never be ridden out of materials that should never see a trail. It'll be a lovely statement piece for a wealthy single track enthusiast, but attach it to a hitch rack at your own peril. A diamond-encrusted, white gold crocodile skin handbag isn't Hermes's bread and butter, but the house puts out just one or two a year -- making the few that exist especially valuable to collectors. 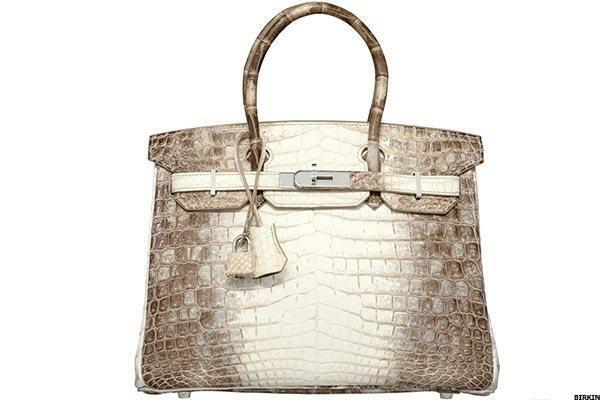 Judging by the action at Christie's in Hong Kong where a 2008 version of this bag sold back in June, the handbag market is doing quite well and their popularity among more knowledgeable collectors isn't waning.A second, smaller version of this bag still fetched roughly $200,000. However, it should be known that the bag's namesake -- British actress Jane Birkin, for whom the bag was named in 1984 -- isn't a fan at all. Last year, she asked for her name to be taken off of the bags, as she finds the methods of culling animal skins for them particularly cruel. That layer of gold and gems doesn't mask the fact that it was an actual crocodile at some point, but judging by the selling price, they do just enough to prevent collectors from pondering it too deeply. Montegrappa likes to call its pens branded with Ernest Hemingway, Frank Sinatra, Salvador Dali, Quincy Jones and Sophia Loren's name "writing instruments" -- but we're still talking about pens here. Ink, cartridges, various degrees of boldness... pens. The pens in the Centennial Dragon series likely shouldn't fall under that description. Their ink will never be spilled on a Post-It note detailing defrosting instructions for the last turkey in the freezer. They won't be writing out worded dollar amounts on checks (P.S. Why are we still doing this?) sent to the local utility company. At best, they're going to write out a sternly worded Dear John/Jane letter from a disgruntled ex who'll take the pen as severance and spend years fighting about it in court. For Montegrappa's 100th anniversary, it made 100 Centennial Dragon pens. Of those, 33 are rose gold, 33 are yellow gold and 33 are white gold. Those go for $225,000 a pop. Then there's this one: A cluster of pearls, diamonds, rubies with a golden dragon wrapping itself around it. 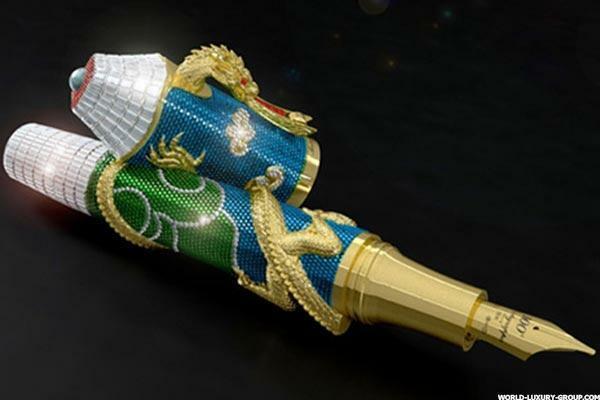 The 18-karat gold pen is inspired by the Nine Dragon Wall at the Forbidden City in Beijing, but perhaps someone should tell Montegrappa that if slowing Chinese economy is bringing fewer bets into Macau, it's likely creating an impossibly small market for heavy $1 million dragon pens as well.